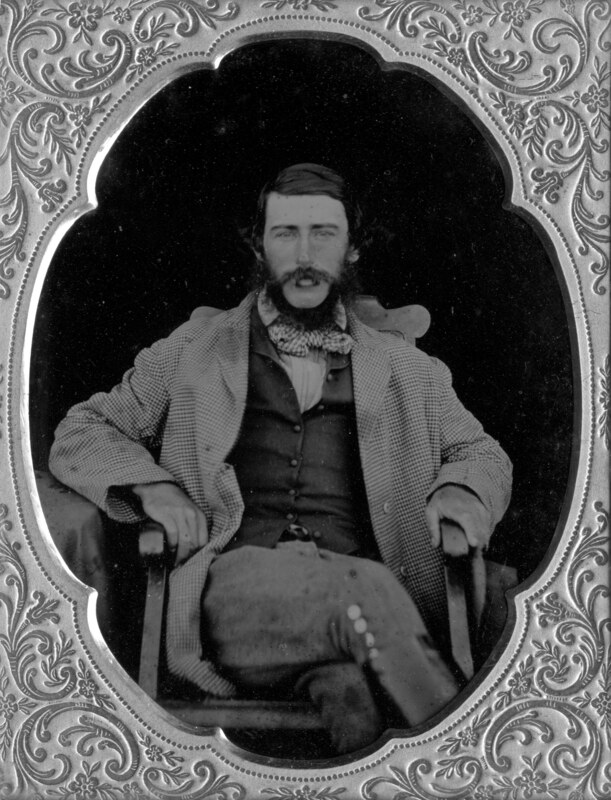 It is a cased ambrotype, and thus likely to date from between 1851 and 1860. The attribution for this shot is solid. The likeness matches a captioned shot of him and is paired with the outback shot below. No other Clarke is known to have traveled to Oz. What is happening with his chin isn't clear. Rev. Charles Clarke, MA, Rector of the Parish of St. Mary's, Henstead, Suffolk. The name Knights came from his paternal grandmother: Anne Knights of Burgh Castle near Yarmouth. On the 27th June 1850 Edward K. Clarke sailed for Hobart, Tasmania, abord a vessel called the Australia. He was just 18 years old. Like his brothers Frank, William and Richard, the prospect of a sedentary existence in East Anglia held little appeal for him. Together with many thousands of other Britains he succumbed to the lure of prosperity which, the guide books alleged, awaited those willing to make the journey to the colonies. All the brothers were raised in the style which their father Charles had intended: one close to his own - that of a country gentleman. All of them were defeated by the environmental conditions they encountered overseas. This photo gives me the shivers. Not that the location it depicts was cold. Indeed, you can almost feel the heat coming off the screen. What did Edward make of 'New South Wales' where his sheep farm was located? Did his upbringing in Suffolk prepare him for this? Did Parson Clarke (who died in 1857) receive this view from his son's new country? On 16th September 1867 Edward was married at Swan Hill, a town on the Murray River, in the state of Victoria to Ellen Dorgan, a maid living at Swan Hill House. She was born around 1847 to William Dorgan and Ellen (née Daly) in Cork, Ireland. The ceremony was conducted according to the Catholic faith of the Dorgans. Edward's CofE clergyman father had died ten years previously, and so did not experience a repeat of the similar deviation undergone by Edward's brother Frank. Edward's marriage produced no children. Balranald, New South Wales, Australia - a town on the Murrumbidgee River. 28th February 1881 at the Town Station of Balranald. 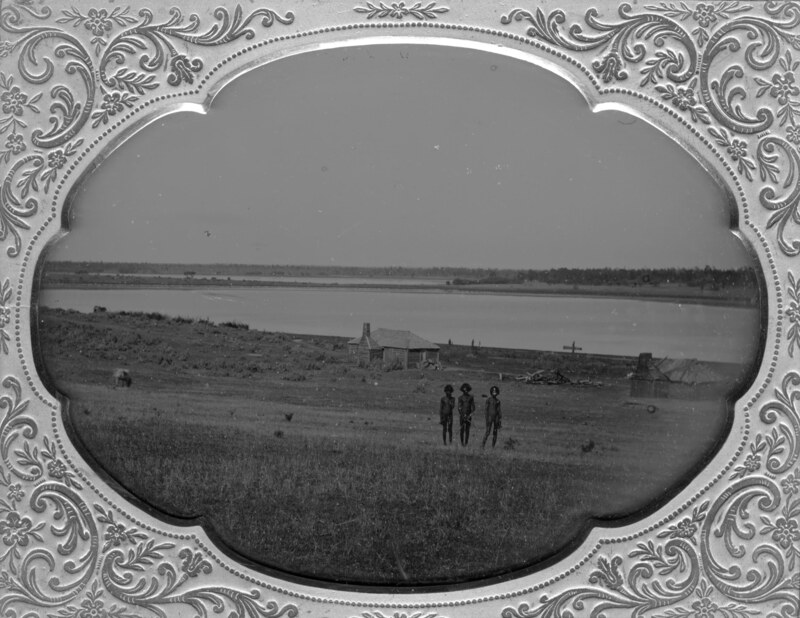 According to family legend, Edward Knights Clarke was drowned in the Murray river at a place called Chalonite. This location, although it has an authentic 'ring' to it, I have been unable to trace. What was Edward doing in the river? Trying, one might speculate, to herd sheep across. February being (presumably) a dry season, the flow should not have been dangerous. More detail if I get it. Last modified: 2010 November 17th.